The Devon Rex is known for its curly coat, which comes in all colors and patterns. Its body is slender but muscular. The head has a slight wedge shape, and the ears are large. These cats are medium in size, and have a pixie-like appearance. These very intelligent cats are very playful and active. They are very giving of affection, and love a lot of attention. They require virtually no grooming because of their short coats. Some people find the Devon Rex are less likely to trigger allergies. Devon Rex do best when kept as indoor-only cats. This breed needs plenty of attention and affection. Devon Rex are very intelligent and active, so become easily bored. The Devon Rex is the result of an accidental mating that took place in England between a feral curly coated male and a straight-haired female. One of the kittens was born with curly hair. He was adopted by a cat fancier named Beryl Cox, and named Kirlee. Kirlee was bred to Cornish Rex females in an attempt to get more curly-coated kittens, but the resulting offspring all had straight coats. 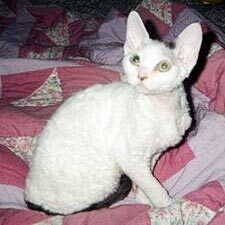 Breeders determined the genetic mutation that caused Kirlee’s unique coat was different from the gene that causes the curly coat of the Cornish Rex. The new breed was called the Devon Rex because Kirlee was born in Devon, England. Some of these cats were imported to the U.S., and were soon recognized by the American Cat Fanciers Association in 1972. The International Cat Fanciers Association (TICA) recognized the breed in 1979, and the Cat Fanciers Association accepted them for registration in 1983.